Reverend Gary Davis was born in Laurens, South Carolina in 1896. He was born partially blind, and became fully blind as an infant. He was the only one of eight children to survive to adulthood. His father was killed when he was ten, his mother didn’t treat him well, so he went to live with his grandmother. He taught himself guitar, and invented a way of playing with many voices at once. In the twenties and thirties he was active in the Piedmont blues scene, and made some recordings. He became a Baptist minister. He moved to New York City in the forties, and performed as a street musician for a while before being rediscovered during the folk revival and becoming very popular with lots of rock stars of the day. All of these are facts straight from the wikipedia, but what the wikipedia can’t tell you is that his music is phenomenal. Such a perfect combination of exquisite technical skill and deeply sweet soulfulness. Such a perfect balance of heavy darkness, which we recognize as part of everybody’s life, and of the hope and humor that make it bearable. Such strange poetry to describe feelings that we all have. I’m flabbergasted (to use one of Malcolm’s vocabulary words) by his music, and by the fact that I haven’t discovered him earlier. I must have heard a song here or there, but I couldn’t have been paying attention, because I wasn’t stopped in my tracks and incapable of doing anything but listening, as I have been all week, steeped in his music. I’m so obsessed with Reverend Gary Davis at the moment that I wanted to make this Sunday interactive playlist all about him. But we obviously need a bit of diversity, so I decided to pick something that he’d fit into nicely. As well as many chilling and beautiful songs about death, sin, and the afterlife, he’s got some beauties about life and love. And he has quite a few versions of Candyman. This being valentine’s day weekend, I decided that was the direction to take. So this week’s Sunday interactive playlist is on the subject of sweets. Of course songs about candy are never really about candy, are they? This soup was perfect for a winter’s night. Flavorful but simple. 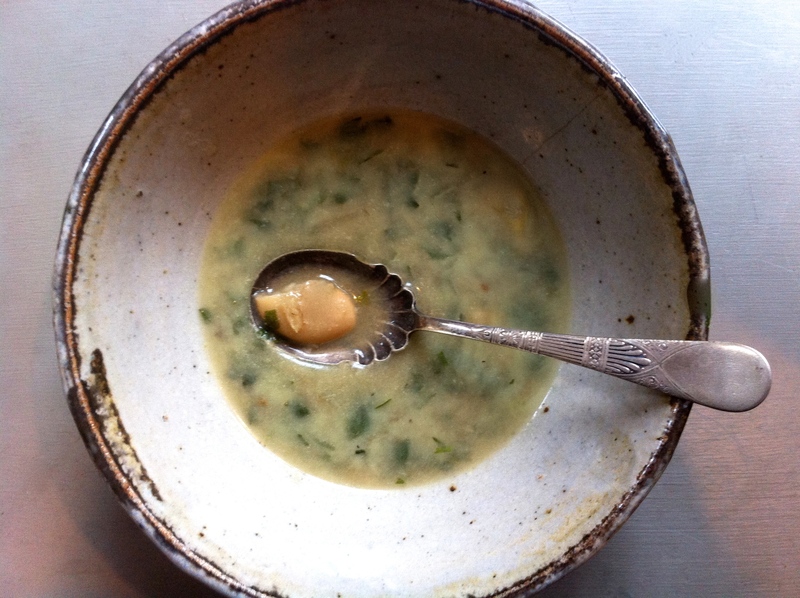 Hearty but brothy and bright, and with the springlike greenness of tarragon. Not at all hard to make. Here’s a link to your interactive playlist. Add what you like, or leave a comment and I’ll add it through the week. There’s Nothing as Trustworthy as the Ordinary Mind of Ordinary Man. So readeth a banner on the wall of Lonesome Rhodes. Lonesome himself is on the balcony, raving like a Tom Waits-voiced Tarzan about how the people listen to him, because the people love him, because he is the people and they are Lonesome. He’s playing to an empty house, his own empty penthouse, lonely and cavernous, wrapped in sinister shadows. But his friend Beanie is laying on the applause – loud and often – on a machine that he himself, Lonesome, invented – it applauds him and laughs with him and oohs and ahs at his wise sayings. He starts to sing that he’s ten thousand miles from home, but he breaks off. He’s breaking down. What is this madness? A face in the Crowd, directed by Elia Kazan in 1957. What a remarkable, odd, oddly contemporary film! It tells the story of Lonesome Rhodes (Andy Griffith), a drifter picked up in a jail by an eager Sarah Lawrence graduate (and all that that implies) played by Patrica Neal. She records him for a radio show on the voice of the common people, called Face in the Crowd. He’s irreverent and folksy. He becomes a star, a personality, first in Arkansas, and then all over the whole country. In New York his show is sponsored by Vitajex, a placebo that he sells as a libido-enhancer (Big Lebowski-esque dream sequence! ); the CEO of Vitajex introduces him to a man running for senator, a tepid, aristocratic person that Rhodes sells as a man of the people. The film’s themes are startlingly relevant today: the intersection of commerce, politics and entertainment; the cynicism of the entertainment industry about the intelligence of their audience “Those morons out there? Shucks, I could take chicken fertilizer and sell it to them as caviar. I could make them eat dog food and think it was steak. Sure, I got ’em like this… You know what the public’s like? A cage of Guinea Pigs. Good Night you stupid idiots. Good Night, you miserable slobs. They’re a lot of trained seals. I toss them a dead fish and they’ll flap their flippers.” In the beginning of the film, Rhodes is irreverent towards the company that endorses him and suspicious of any commercial enterprises. He appeals on the air for all of his listeners to help a woman whose house has burnt down. By the end he’s on TV, exchanging quips with his senator about the evils of social security, and thinking of his audience, the crowd, the ordinary people, only in terms of the money, votes, or adulation they can give him. He’s seduced by the idea that he could become one of the elite, that he could guide the thinking of the masses. He’s funded by the Koch brothers of the day, to tell people what to buy, and to vote for the guy who will keep them poor, suspicious, and under-educated. He’s an ordinary person, but some people are more ordinary than others. Of course his career crashes, his women leave him, and he’s back where he started, ten thousand miles from home, and he doesn’t know where to go. I bought a bag of meyer lemons! Look for them in every single recipe I make for the next week or so! They’re so lovely – sweet, tart, a little piney. I was thinking about french lentils, as one does. I love them, but I always seem to cook them the same way. I decided to try something a little different, and give them a kick with meyer lemons and ginger. This soup was so delicious! 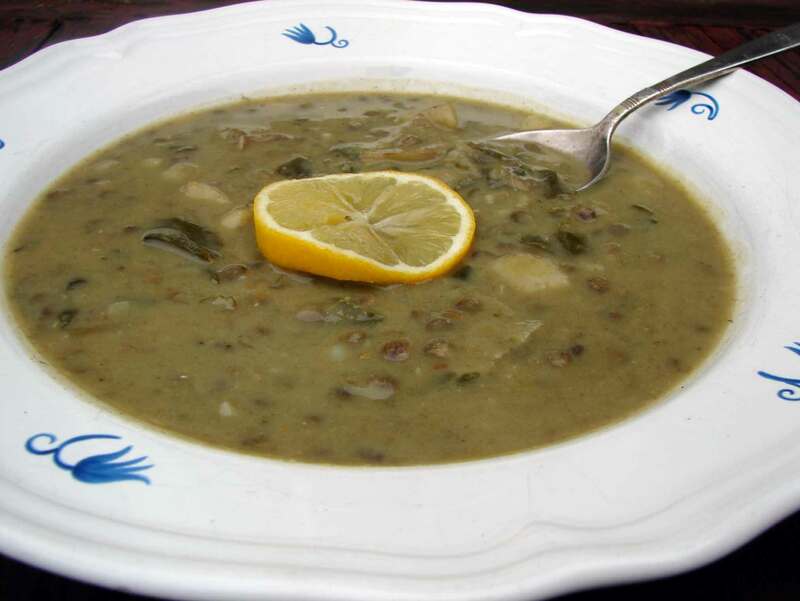 Comforting with potatoes and lentils, but very lively, with not just a squeeze of lemon, but the juice of two whole lemons!! Oh yes. Here’s A Face in the Crowd, sung by Andy Griffith (to the tune of Sitting on top of the World, by the Mississippi Sheiks. Mushrooms and shallots and crisps, oh my! 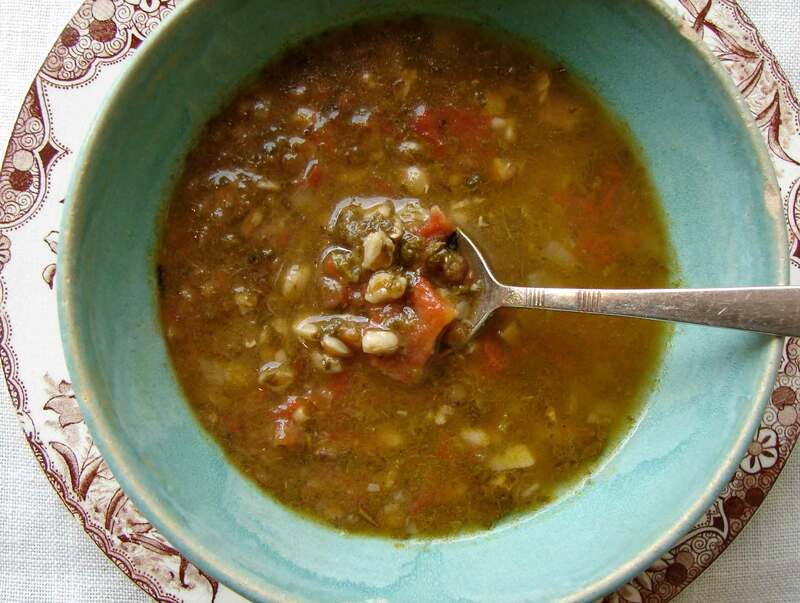 Beautiful, tasty french lentils don’t get mushy. If you cook them properly they retain a little crunch, so this isn’t the porridge-y lentil soup that you might expect. 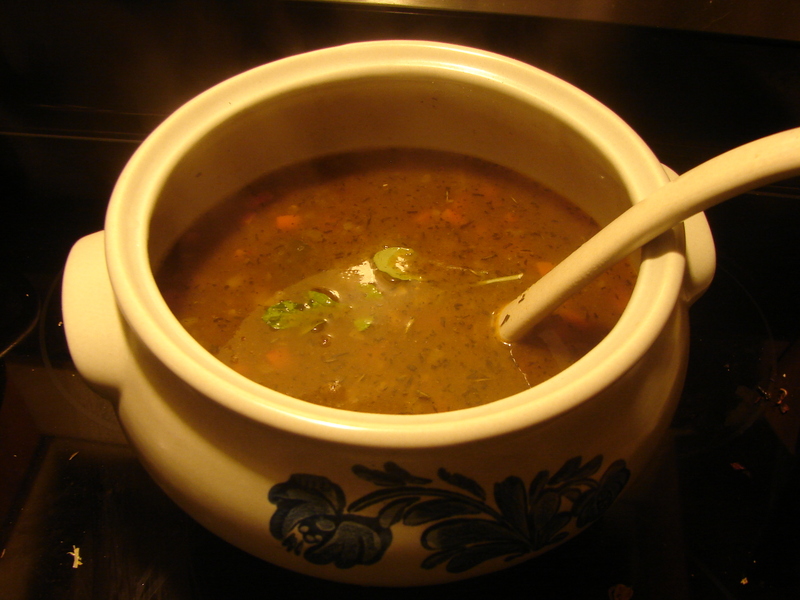 The lentils, carrots and potatoes float in a delicious, herb-infused broth. 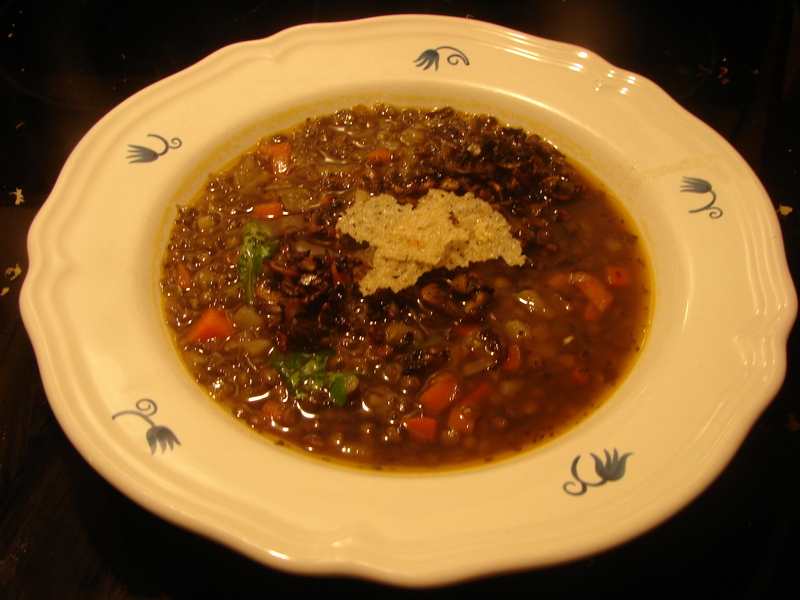 And I love mushrooms, especially in combination with french lentils, but I don’t love the way they get a bit slimy in soup – I like them crispy and flavorful. So I decided to roast them with shallots until they’re very crispy, and use them as a garnish. And to top it all off, I made little lacy crisps of sharp cheddar, which melt into your soup. Eat it with a good loaf of ciabatta and you’re all set!